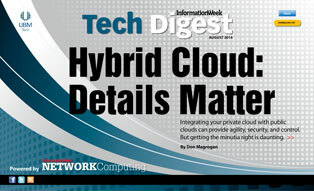 This is Network Computing's August Tech Digest on hybrid clouds. Access is free with registration in the InformationWeek community. Just register below. There's no cost, and it takes only a few minutes. Once done, click the "Go To Digital Issue" button at the bottom of the page. Details Matter In Hybrid Cloud: Integrating your private cloud with public clouds can provide agility, security, and control. But getting the minutia right is daunting. The information submitted is collected by both TechWeb and our sponsors.